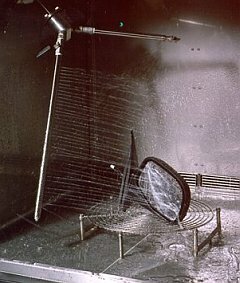 ESPEC makes rain and spray testing easier by offering a standard chamber capable of published and OEM proprietary test methods. The standardized design can be configured for the rain/spray tests you need, eliminating the guesswork in buying a chamber. The system is based on the JIS/SAE specification requirements, and can also accomplish individual automaker’s tests, as well as electrical-enclosure tests. ESPEC’s modular design allows you to add on additional features, depending on the number and type of tests required. One possible choice is to integrate the spray system with a regular temperature and humidity chamber to save money and floor space, while also creating an opportunity to simulate actual operating conditions your product may experience. Our system uses multiple control solenoids to vary the water’s spray volume/pressure. A holding tank prepares the water to the desired temperature, if required. A pump ensures the water is delivered in the proper pressure range. The water is fed to a motorized manifold that rotates the spray arms. Each spray arm has an adjustable valve to allow finer control of the spray. The SAE specification J2245 is modelled after the JIS D0203 and doesn’t differ greatly. Details about the nozzle types and the rotating nature of the spray arms and product table are also included in the requirements. Additionally, drip and car wash tests are also specified. S1 Spray room temperature water with 40 nozzles at 14.2 psi (1 kgf/cm2) for 30 minutes. The flow rate of the water shall be 6.5 gallons/min. (24.5 L/m). S2 Spray room temperature water with 40 nozzles at 42.7 psi (3 kgf/cm2) for 60 minutes. The flow rate of the water shall be 10.3 gallons/min. (39.2 L/m). R1 Spray room temperature water with two nozzles at 4.3 psi (0.3 kgf/cm2) for 10 minutes. The flow rate of the water shall be 0.8 gallons/min. (3.2 L/m). R2 Spray room temperature water with two nozzles at 1.4 psi (0.1 kgf/cm2) for 10 minutes. The flow rate of the water shall be 0.5 gallons/min. (1.9 L/m). Heat the sample to a temperature above boiling, then spray with cold water for about two minutes. Repeat cycle. Heat the sample to boiling temperature, then spray with room temperature water for about fifteen minutes. Repeat cycle. Simulate a car wash by using high pressure spray.